Researchers sought to determine whether mutational profiles of lung cancers differ between black and white patients. 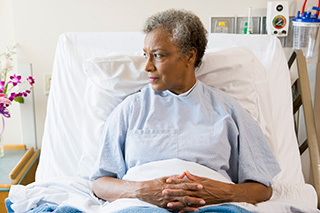 Although lung cancer is the leading cause of cancer death in the United States in all ethnic and racial groups, the overall death rate from lung cancer is higher in black patients than in white patients. Because differences in mutational frequencies could explain differences in prognosis and lead to a reduction in outcome disparities, researchers sought to determine whether mutational profiles of lung cancers differ between black and white patients. For the study, investigators at Dana-Farber Cancer Institute in Boston, Massachusetts, analyzed tumor specimens collected from Baptist Cancer Center in Memphis, Tennessee, between 2004 and 2014. Researchers performed genomic analysis by massively parallel sequencing of 506 cancer genes. Overall, researchers profiled 509 lung cancer tumor specimens, including 319 adenocarcinomas and 142 squamous cell carcinomas, from 245 black patients and 264 white patients. Using 313 adenocarcinomas and 138 squamous cell carcinomas with genetically supported ancestry, researchers found no significant difference in the overall mutational frequencies or copy number changes between black and white patients in either tumor subtype. In lung adenocarcinoma samples, results further revealed no significant difference in specific activating alterations in members of the receptor tyrosine kinase/Ras/Raf pathway, including EGFR and KRAS, between white and black patients. The findings ultimately suggest that both black and white populations could derive significant benefit from participating in clinical trials evaluating targeted therapies.